Curious about the new Canvas LMS? Educational Technology will hold in person trainings in informational sessions in December to teach the new LMS. Come see how it works, how it’s different from Moodle, and find out what options are available for moving to Canvas. Canvas offers strong support to faculty and students through their extensive video and step-by-step guides. Search the Canvas guides to help answer your how-to questions and see what other capabilities Canvas offers. Canvas is a web-based tool for teaching, learning, and collaboration. Canvas is a particularly strong tool for student learning when all classes use Canvas, as it becomes a one-stop-shop for their academic work, collaborations, and communications. All Puget Sound classes are automatically provisioned with a Canvas site. Canvas integrates with many other teaching and learning tools used at Puget Sound. New features, enhancements and bug fixes are applied to Canvas every three weeks. Canvas is developed and hosted by Instructure. All Canvas users log into Canvas with their Puget Sound NetID and password. In Spring 2018, seven faculty members successfully piloted the use of the Canvas LMS. The use of Canvas in higher-ed and within the K-12 sector is growing, especially in Washington State. Two of the Independent Colleges of Washington have recently switched over to the use of Canvas, as well as 10 of our Northwest Academic Computing Consortium colleagues. Canvas offers more robust features than Moodle, our current LMS, including a mobile app, embedded video, and better organization of course materials. It also has superior online training materials and technical support options with no downtime required for software upgrades. During the spring pilot so far, 15 classes have been hosted on Canvas, which involved 239 student attendees. Faculty departments using Canvas included Chemistry, Classics, Education, Geology, German, Latin, and Math, as well as a two Seminar and Scholarly Inquiry (SSI) courses. One class was setup as a meta-course with 2 sections. In the pilot, the faculty who transitioned their classes to Canvas did so by either uploading a Moodle course directly into Canvas or building out a new class module using advanced features such as discussion forums and peer review of assignments. We found that it takes only a few minutes to upload a Moodle course directly into Canvas and the import function is setup to seamlessly translate the course into Canvas. Faculty members who piloted Canvas all reported being satisfied or very satisfied with Canvas. We are in the process of setting up several more Canvas classes for faculty members as interest in the pilot is growing. Students who responded to our survey about their use of Canvas this spring have remarked on the improved gradebook features, ability to conduct intellectual discussions via the discussion forums, and especially appreciated being able to use the Canvas app. Overall student responses were very positive and over 80% felt that Canvas would be an improvement over Moodle. What about my courses on Moodle? Due to the success of our pilot and the changing support for Moodle, we would recommend a phased approach moving from Moodle to Canvas over the next one to two years. 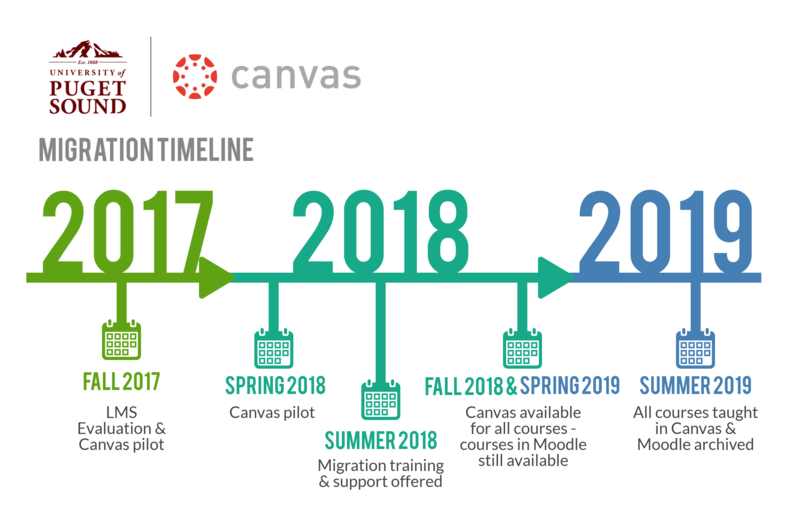 We already have some interested faculty who want to use Canvas this summer and we are ready to assist faculty members interested in possibly moving to Canvas in the Fall. Please note that Moodle will be retained as an archive and faculty will be assisted in moving classes to Canvas as well as offered training and self-help materials to aid in the transition. Contact Ed Tech if you would like to join in testing Canvas this spring and/or attend any of our upcoming training sessions, more information will be posted soon. Canvas is a management system with a focus on extensibility. Third party learning tools, such as blogs, wikis, Piazza discussion boards and a host of other tools can easily be connected to individual course sites by the faculty who administers a given course. Canvas’ notification and messaging tools are integrated with Facebook, Twitter and a number of other web services; control over where to receive messages resides with each individual user. Canvas is a particularly strong tool for student learning when all of their classes use Canvas and it becomes a one-stop-shop for their academic work, collaborations, and communications. Rich Content Editor to create webpages, link files, embed media, insert images, etc. Integrated audio and video tools, including YouTube embedding. Instructure also provides 24/7/365 user support, by phone, chat, or email. To access Instructure’s help, log in to Canvas and click the Help button in the lower left corner.